Have you ever wondered from where your website visitors come from, rather than just a domain referral from Facebook, Twitter or Google? How about finding out if the large banner on your homepage drives more traffic to your products than the smaller banner in your sidebar? While tracking your online success Google Analytics can help you get insights from your data. For example if you have a Google AdWords account integrated with your Google Analytics account, then you can monitor your AdWords campaigns within Google Analytics. Now, if you are not assigning visitors from different sources to Google Analytics Campaigns, then you won’t be able to properly segment. Without proper segmentation, it’s hard to make actionable insights. If you’re looking for these kinds of details about your traffic, then creating custom campaigns within Google Analytics is the solution. This article will show you how to do just that. 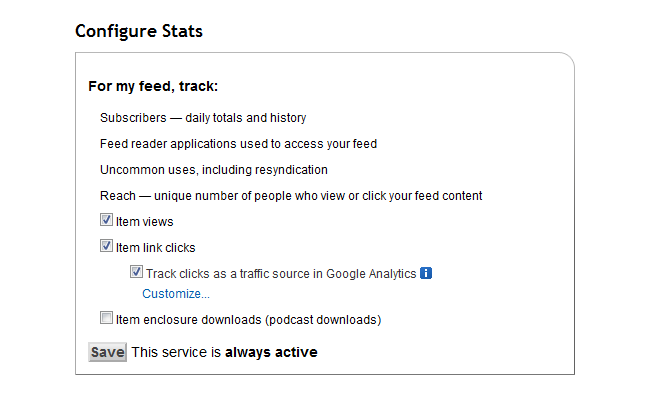 These tracking parameters show that traffic has arrived at this webpage from the Blogaholic RSS feed. When a user clicks this link, Google Analytics records this data as the traffic source. There are a few other parameters that you can use with campaign tagging. Campaign Source (utm_source): This is the source bucket that you’d like to identify users as coming from. In paid search, you’d want to distinguish Google, Yahoo and MSN. You can use the newsletter service name, such as MailChimp. Campaign Medium (utm_medium): This is the medium by which the campaign was delivered, such as email or radio, etc. Campaign Term (utm_term): This optional field is used to specify the keyword that was used to display the campaign. Campaign Content (utm_content): This optional field is used to differentiate the specific link or entry point method that brought the user to your site. This could be a specific link’s title or can be used for A/B testing. Campaign Name (utm_campaign): This is the name of your campaign or promotional effort. However, you don’t need to worry about these URL parameters if you use the Google Analytics URL Builder to generate your own URLs. It is important to be consistent in your usage of how you structure your campaign tags. Be sure to keep an excel spread sheet with your campaign tag structure. It makes creating new campaign tags so much easier! 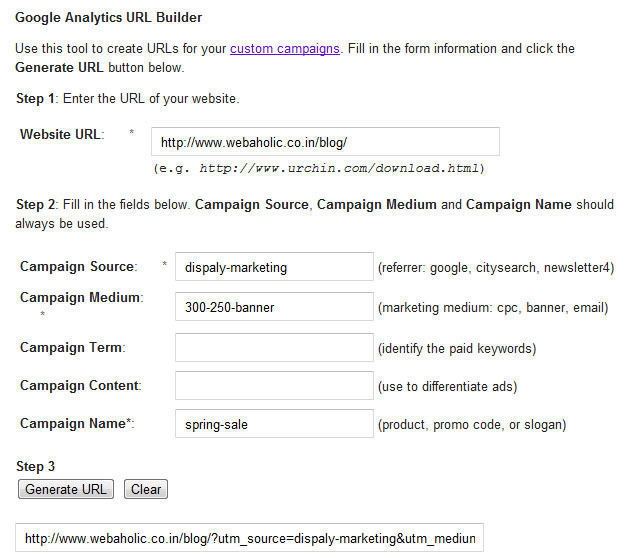 You can use our Multiple URL Builder Tool for your campaigns. Email Marketing: You can tag your email campaigns with campaign tags, such as your newsletter, to see which newsletters get the most clicks from your readers. There are several online email marketing softwares that automatically apply Google Analytics campaign tags to the links included within your emails. 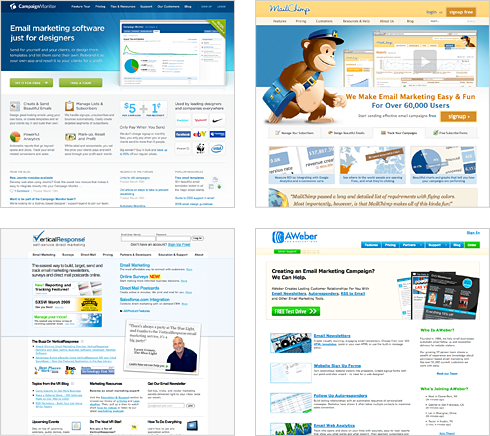 Such as Campaign Monitor, MailChimp, VerticalResponse and AWeber. This is a brilliant way for testing whether your buyers are more apt to shop during weekends or weekdays, or if they’re more likely to click on a product link that’s in a text or a banner format. Display Marketing: If you have different sized banner ads on multiple websites, you can use the UTM parameters to track the campaign theme of the banners. If you make a deal with a Display Network to promote your product, you of course want to know the result of your investment. You can tag these Display Networks and analyze the results. This will let you see at a glance which sites are sending the most visitors to you and which banners have the best results. Social Media Campaign Tracking: You can track visits from your Social Media campaigns by using campaign tagging on your URLs. You can track the tweets you send out by adding a tag like above to your URL’s on Twitter. Even you can do this while shortening URLs such as bit.ly, prior shortening them. 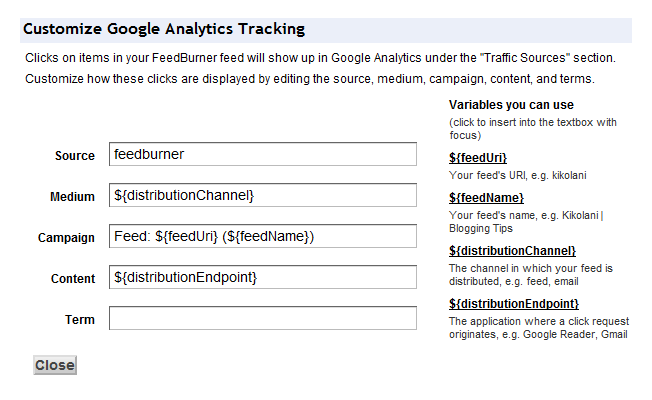 RSS Feeds Tracking: You can also track visits from RSS feeds with Feedburner and Google Analytics. First set up your RSS feed with Feedburner. You can follow this Feedburner QuickStart Guides for Blogger, WordPress, TypePad, MySpace and Podcasting. Now, to configure your Feedburner feed with Google Analytics, go to the Analyze tab and, under Services, click on Configure Stats. Check the boxes for Item link clicks & Track clicks as a traffic source in Google Analytics, then click on the Customize link. By default campaign tracking is already enabled in Feedburner, but you can customize them if you wish to see different tags in your analytics. Offline Campaign Tracking: An often overlooked channel of campaign tracking is offline campaigns. If you stick your website’s URL up on a huge billboard alongside the freeway or print media magazine, but surely you don’t want to put an extremely long URL with campaign tracking parameters in it. You can use this method for QR Code, Radio, Magazines, Newspapers, Brochures and TV. Problem: While tagging your campaigns try to use the same notation. As an example, email marketing can be described as QR-Code, qrcode, qr-code or QRcode. If you are not using the same notation, Google Analytics will report multiple notations for the medium QR Code Marketing. This makes a correct way of analyzing the data more difficult. Solution: The use of capitals can be solved by configuring lowercase filters on the different parameters. These parameters will make sure that the mediums QRcode and qr-code will return in Google Analytics as qr-code. You can find more on the use of lowercase filters in Google Analytics Help Center here. Problem: Modern search engines are highly efficient at finding and crawling pages that shouldn’t end up in a search engine. Problem starts with when a newsletter campaign with campaign tracking parameters in it is published on your website or a URL with tracking code is tweeted in twitter. This from an SEO standpoint can lead to diffusion of link juice and duplicate content issues. Solution: To avoid these issues, we you can kick off campaign parameters with the hash tag and modify your GA tracking code using the SetAllowAnchor attribute, so GA recognizes the hash tag as way to kick off a campaign tracking URLs. You can find more helpful readings from Google here. You can only use campaign tagging on external links that point to your internal site. Do NOT, for example, add campaign parameters to URLs from a call-to-action on your homepage that links to another interior page. Once people have interacted with the custom campaign URLs you’ve created, you can view their data in your Google Analytics account. Now, to access the Campaign reports first log in to Google Analytics account, navigate to Traffic Sources > Sources > Campaigns. This will show you how much traffic you’ve received on the campaigns, using the various campaign tracking parameters you created. Hope this article makes your job easier and help you get started measuring your campaigns using Google Analytics. Please let us know what your suggestions are regarding the tagging of campaigns. Be sure to subscribe and be the first to receive similar articles right to your inbox. hi, i have put some custom campaigns variables on my site, at the main banner skins. The problem is that only the 2 of them are recorded! I mean i have 4 banners each one with different customa campaign variable and i get statistics for only the 2 of them, the other 2 are just not recorded anywhere!